Once you have mastered the art of Smoking Bratwurst – it is time to up your game a little and try your hand at another BBQ staple: Baby Back Ribs! A lot of people’s favorite food of the smoker, BBRs are not to be taken lightly. I like to make mine tender, but not fall-off-the-bone tender. A lot of (gruesome) chain restaurants have made people think that BBRs should be cooked (I believe they steam/braise them at most of those restaurants) so they can be eaten without teeth. I tend to disagree, and go more for the BBQ competition level of doneness, ie tender, but not doughy and fall-of-the-bone. Anyway, if you want fall-of-the-bone and/or do not have teeth, I will teach you how to do that too. I like to serve my BBRs straight up with a coleslaw on the side and some homemade pickles. For this occasion photographed, I made my regular creamy coleslaw recipe but substitued regular cabbage with the red one for some interesting color combos. Some people like extra sweet and smoky bbq sauce on the side! Your favorite BBQ rub – this one works well for ribs too. Your favorite BBQ sauce for glazing at the end if you want to. 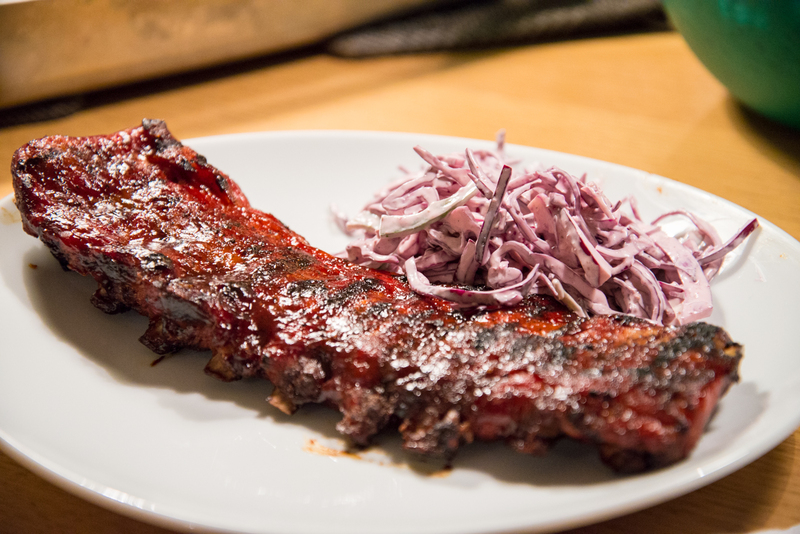 I like a sweet and smoky style sauce for ribs, not too spicy. Your favorite store bought or homemade one will do! We are going to use the three step method for doing BBRs. That means step 1 is smoking the ribs, step 2 is foiling and steaming, step 3 is finishing/glazing. This method is sometimes referred to as the 3-2-1 methods, where the numbers refer to number of hours in each step. 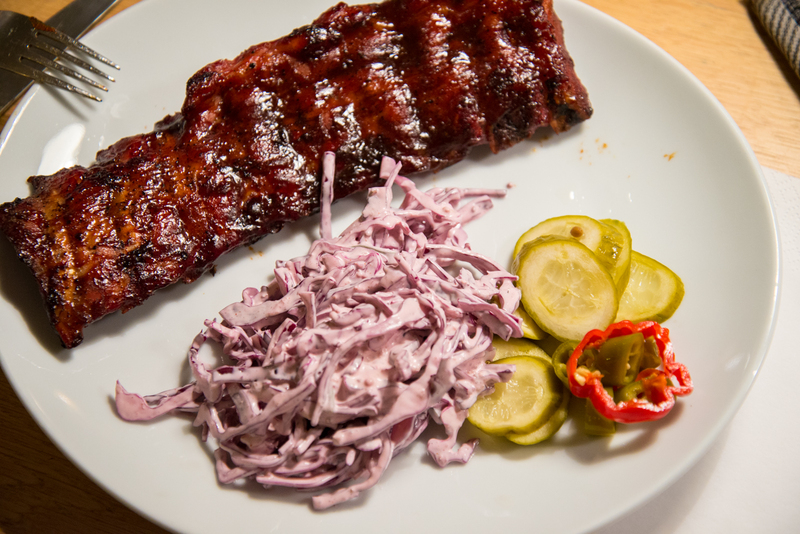 Anywho – the goal is not to achieve 3, 2 and 1, but to achieve rib perfection, so your mileage on those may vary, but as a guideline it is sound. Prep the baby back ribs by removing the membrane from the bone side. It’s very easy to do, check out a video over here if you don’t know how. Fire up your grill or smoker and try to stabilize the temperature in the desired range of 110-120C (230-250F). On my Webers I will use a water pan to help me out in the stabilizing, it adds both mass and moisture inside the grill. On my Primo Grill I don’t really need that, and I also like to put the meat in when the grill is warming up, so it can get the maximum amount of smoke time. Remember to get good smoke going before putting in the meat. Smoke the meat for as long it takes for the racks to reach 80-90C (175-195F)in the meatiest parts. The longer you spend on this step, the more smokey flavors. Once they are smoked, it is time for step 2, the foiling and steaming of the ribs. Put them in a stainless steel pan on top of a rack, or on top of some crumbled up foil so they don’t touch the bottom, add a cup of water or apple juice, and cover with two layers of foil so it’s fairly airtight. Place the pan back on the grill. Now for steaming time, this can take anything from 45-120 minutes. The best way to find out if they are finished is to check every 15 minutes towards the end. Take the foil off, wiggle the bones, pole them a little bit. When they are close to done, the meat should loosen from the bone with not too much effort. If you want them chain restaurant style, toothless done, they should start coming apart if you try to lift from one end. Whenever your preferred doneness is achieved, take the pan of the grill, and increase the grill temp to about 150-160C (300-320F). 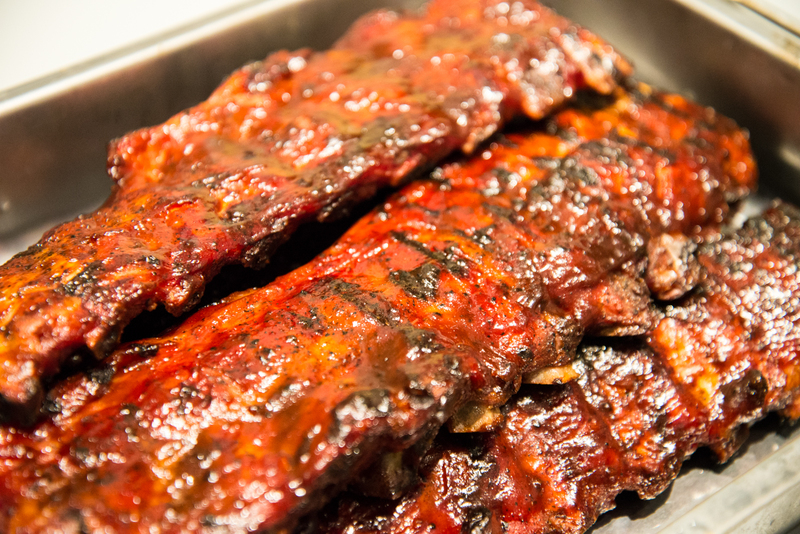 This is the best temperature for the third and last step – finishing the ribs. The reason you don’t go above 160C/320F for the finishing, is that at about 175C/350F, sugar will burn. This means your BBQ sauce and possibly your rub will turn from sweet to nasty in no time. So, once stabilized at the new higher temp, lay out the ribs again, and brush them with a layer of your favorite BBQ sauce on both sides. Leave them on the indirect side 10 minutes, add another layer and flip, and leave them for another 10 minutes. After this they should have a nice, glossy laquer to them, and they should be finished, so serve it up!